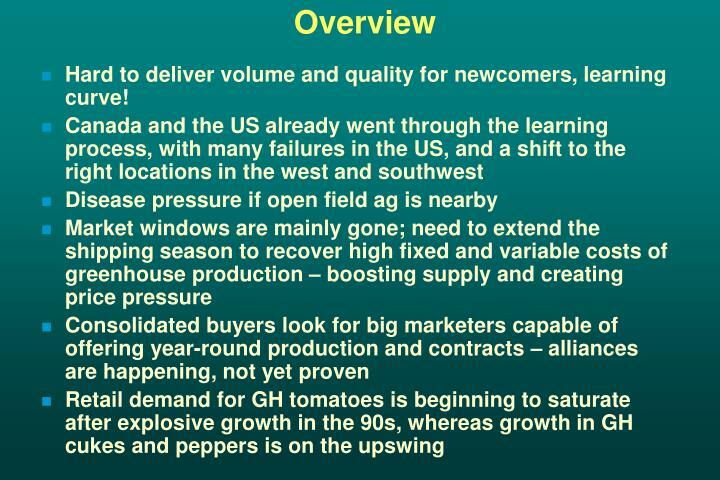 Hard to deliver volume and quality for newcomers, learning curve! 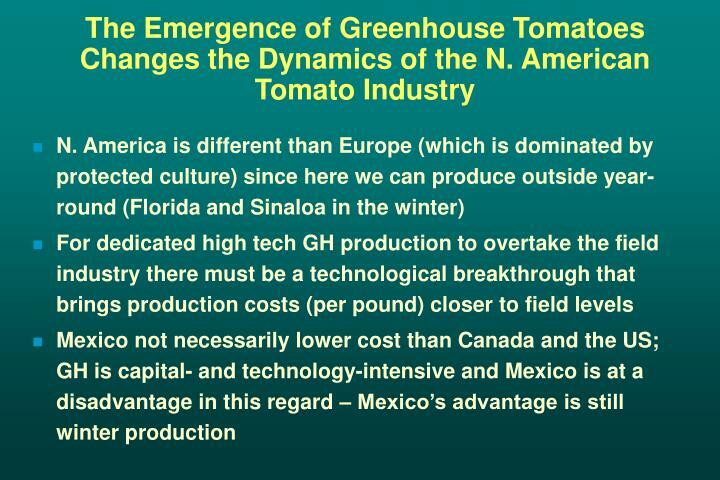 *Excludes domestic production of grape and cherry tomatoes. 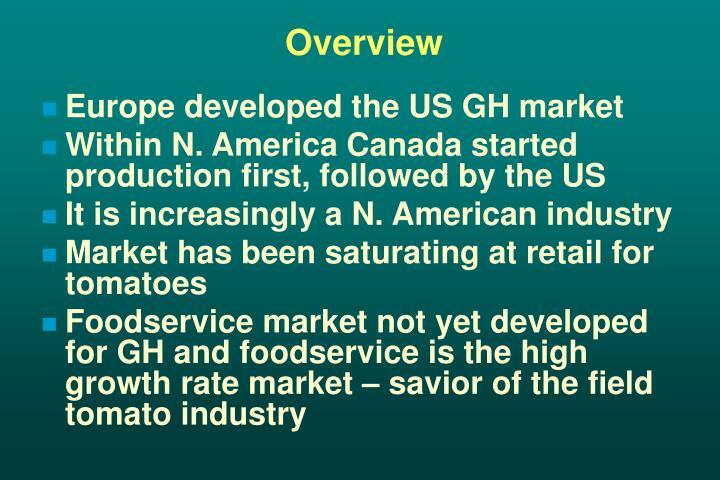 Imported grape, cherry and GH tomatoes included for all years. 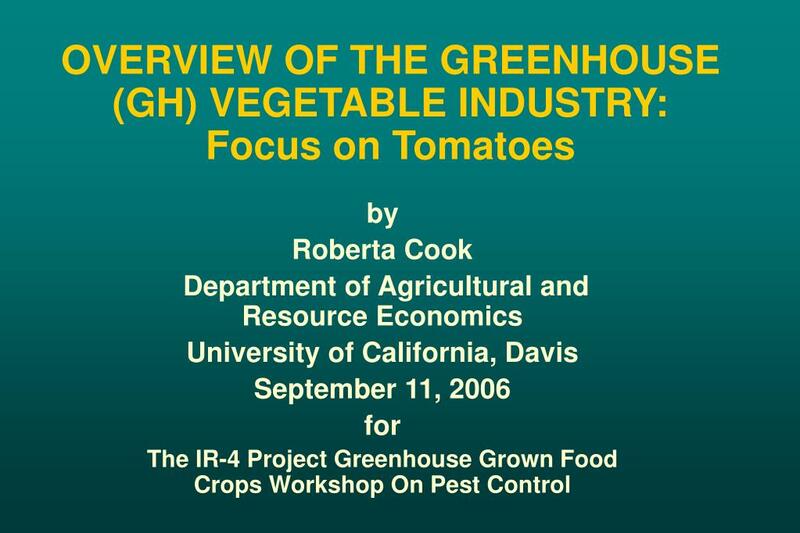 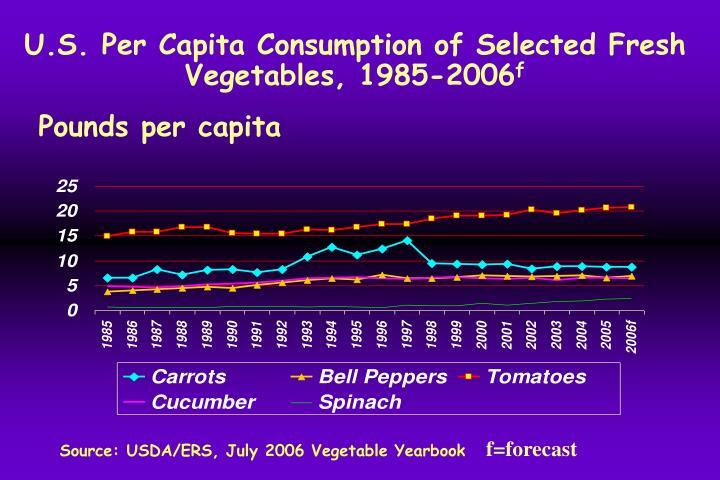 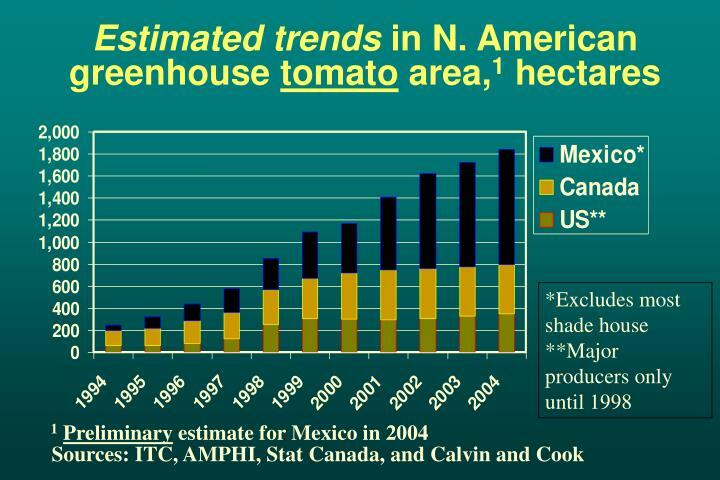 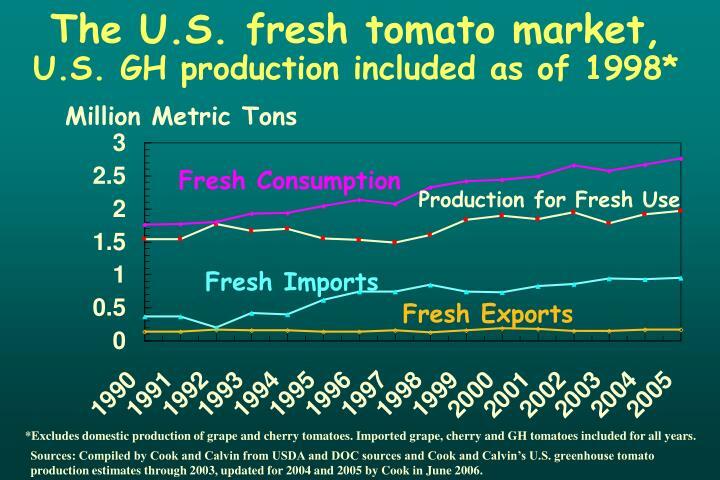 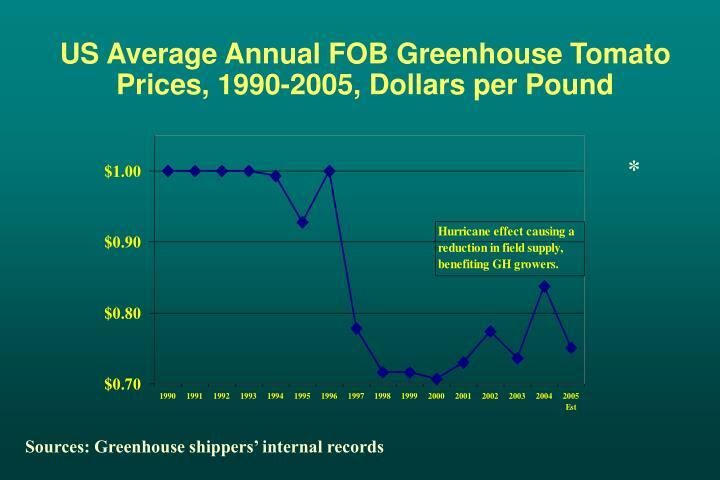 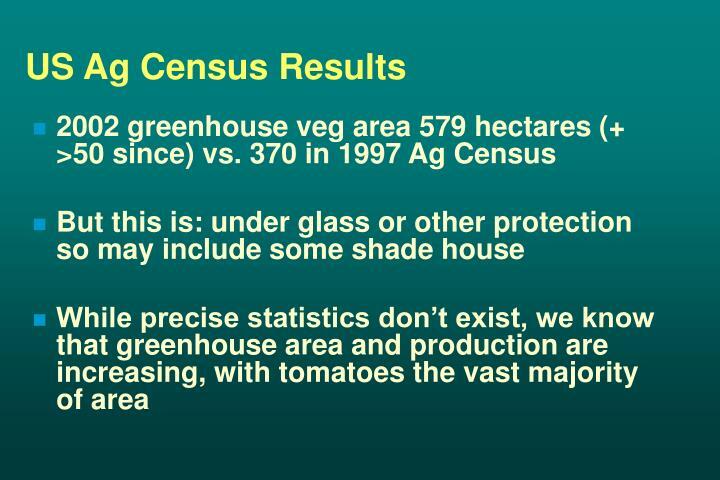 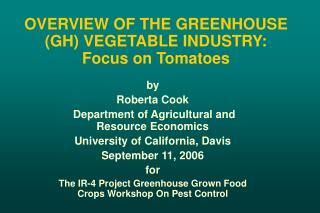 Sources: Compiled by Cook and Calvin from USDA and DOC sources and Cook and Calvin’s U.S. greenhouse tomato production estimates through 2003, updated for 2004 and 2005 by Cook in June 2006. 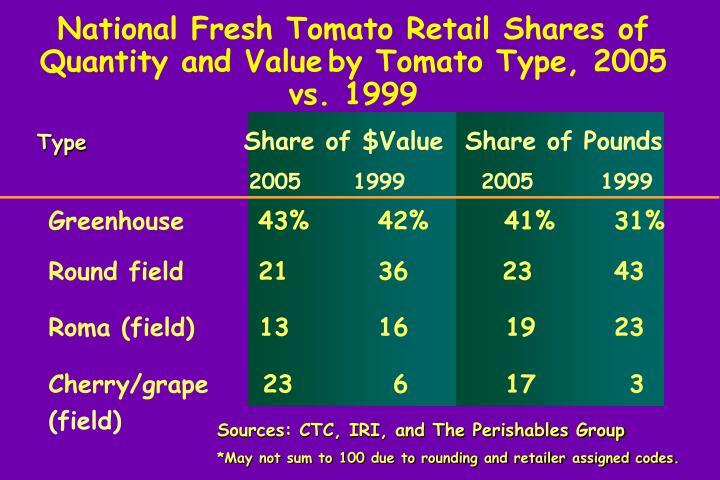 *May not sum to 100 due to rounding and retailer assigned codes. 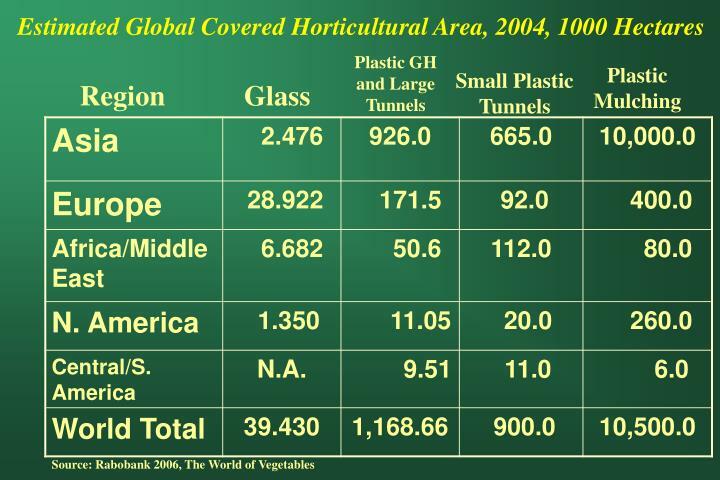 2 2003; 3Simple average, 306 if weighted average. 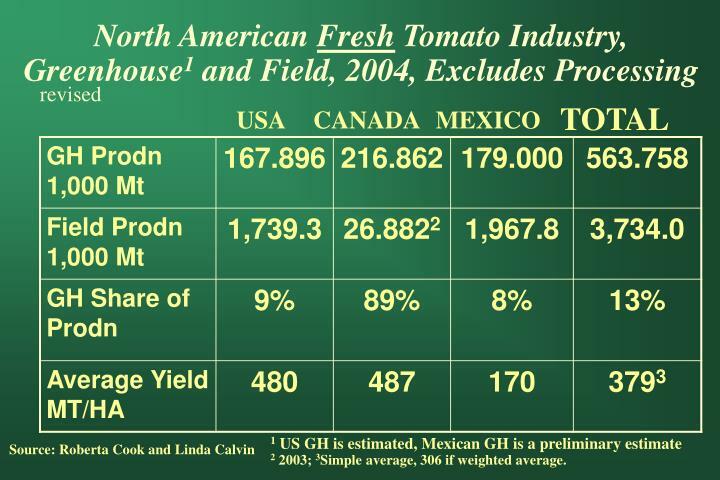 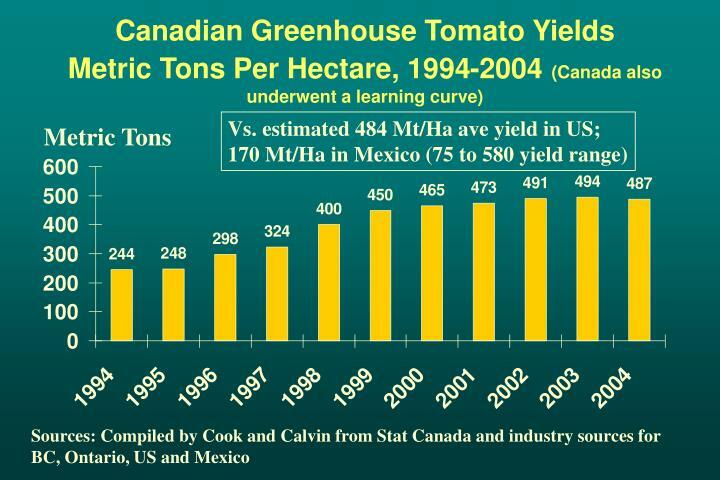 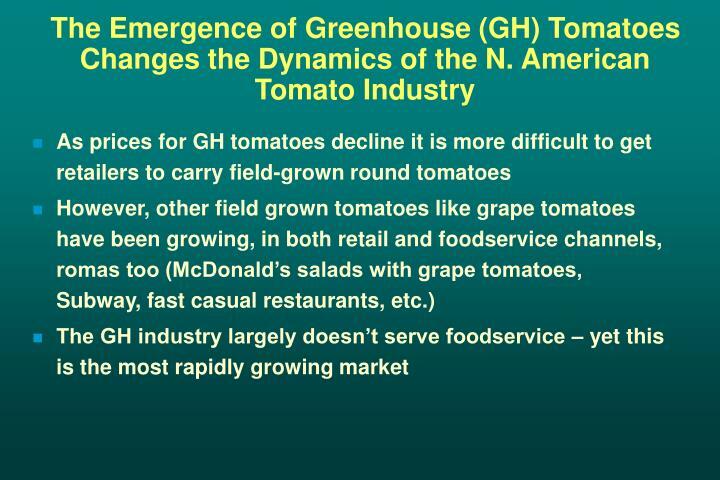 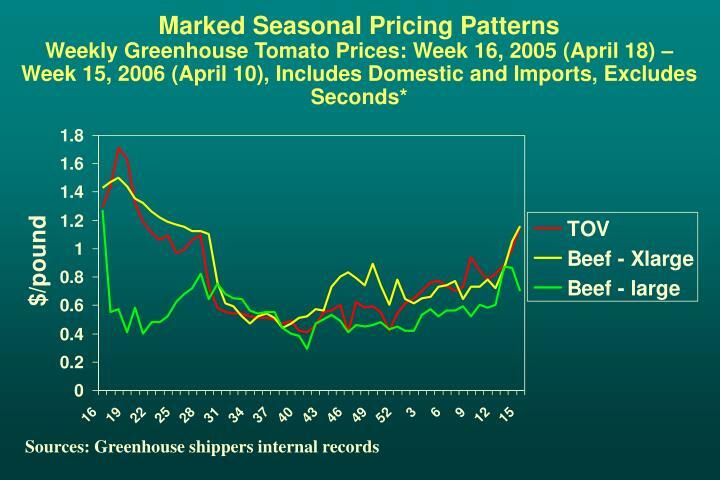 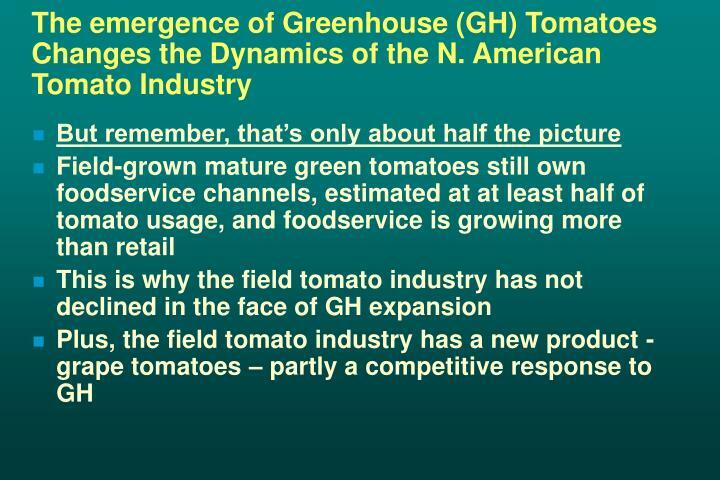 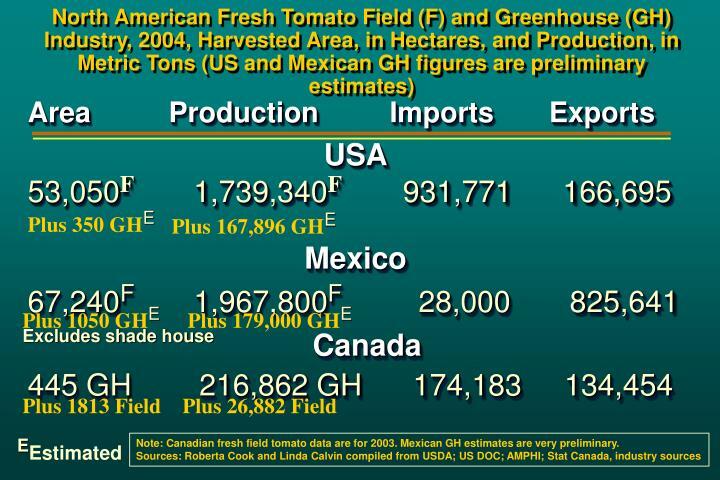 Note: Canadian fresh field tomato data are for 2003. 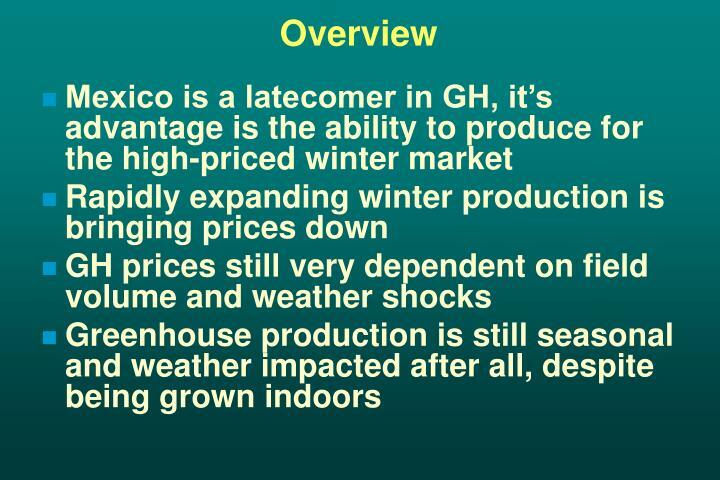 Mexican GH estimates are very preliminary. 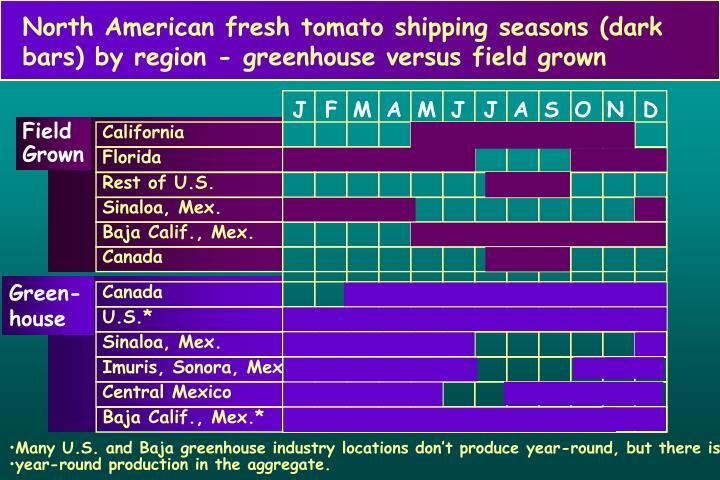 year-round production in the aggregate. 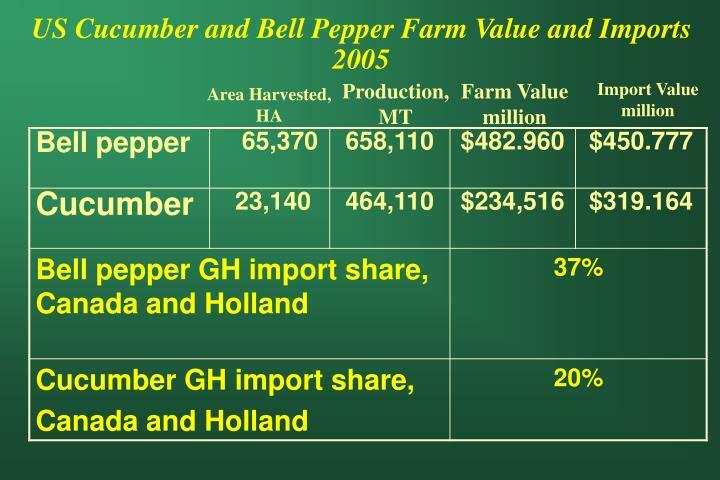 *Excludes domestic production of greenhouse bell peppers but imported greenhouse peppers are included. 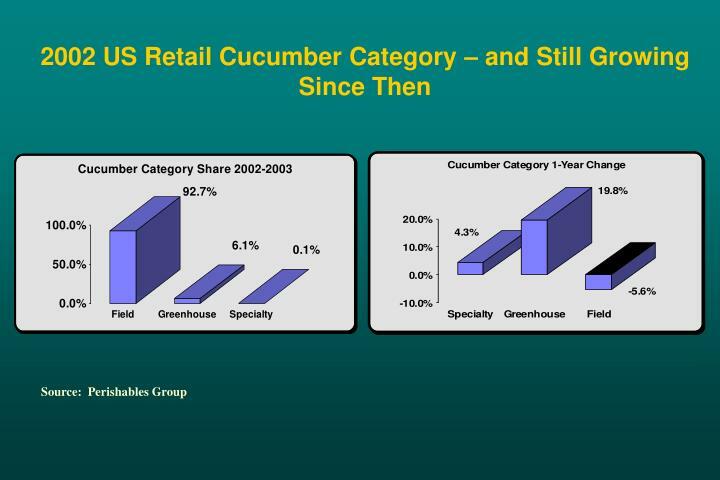 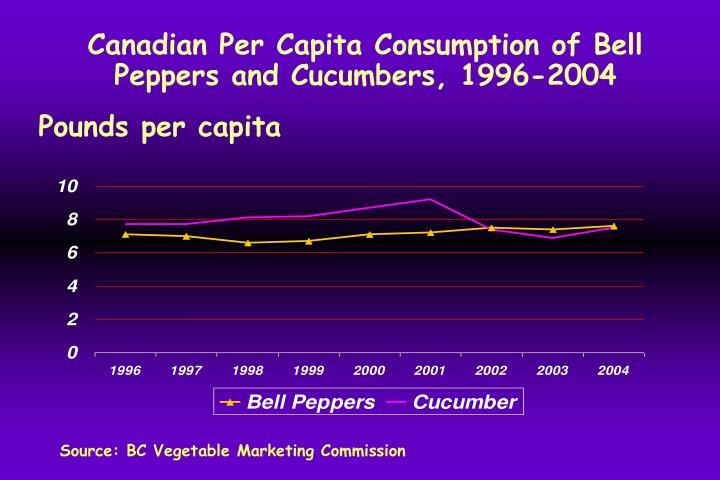 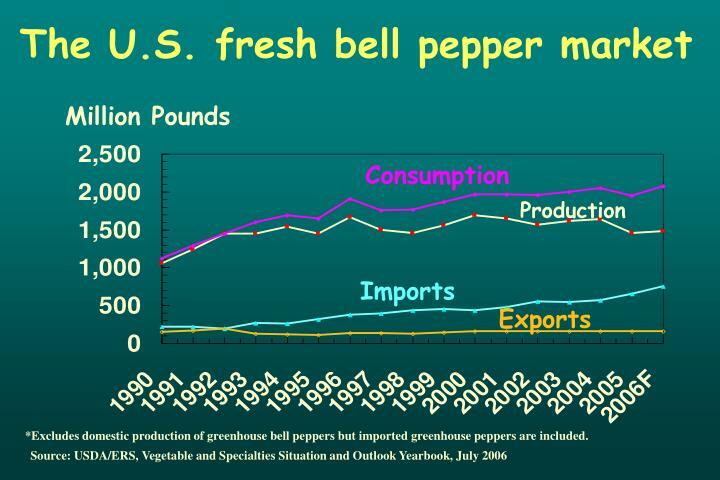 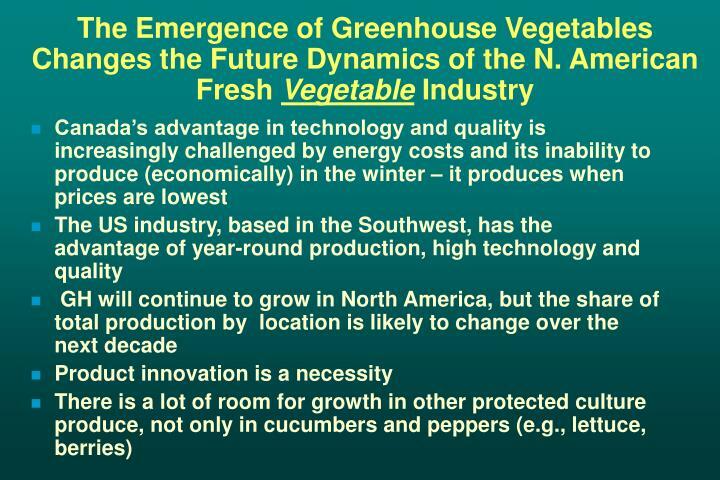 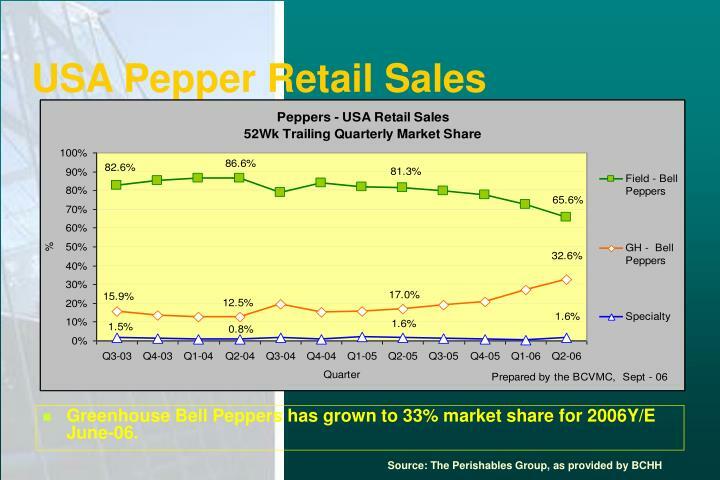 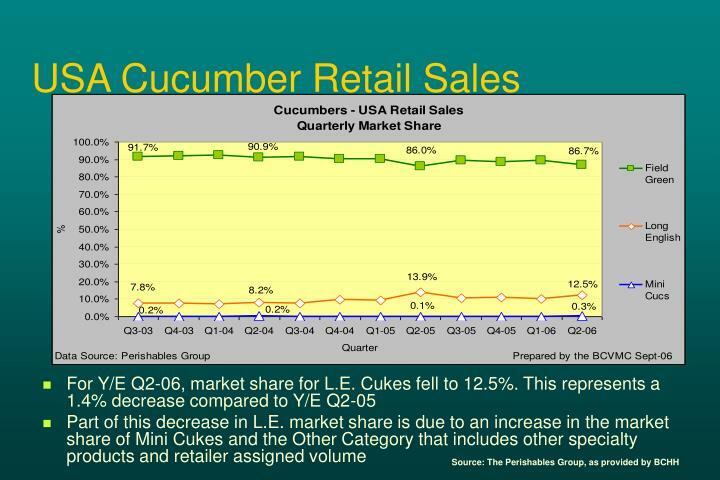 Greenhouse Bell Peppers has grown to 33% market share for 2006Y/E June-06. 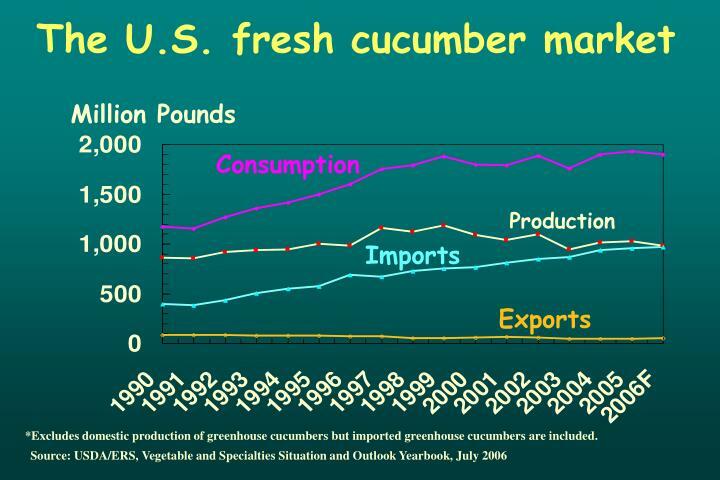 *Excludes domestic production of greenhouse cucumbers but imported greenhouse cucumbers are included. 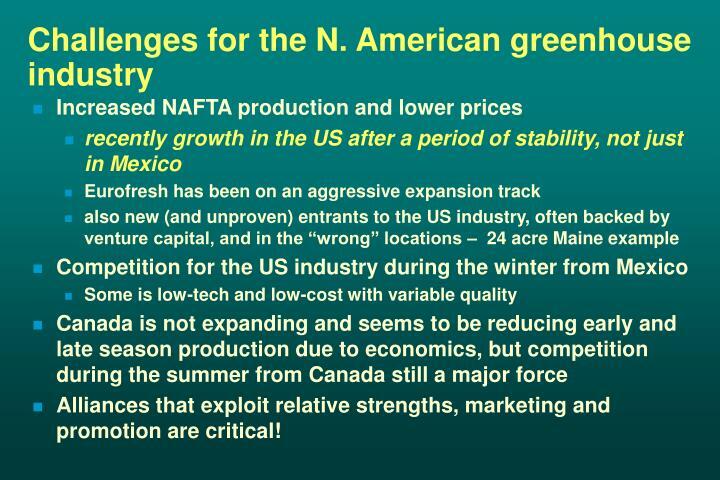 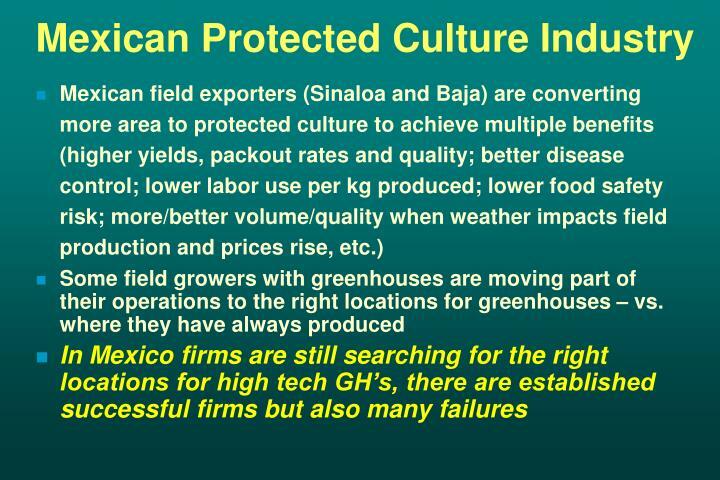 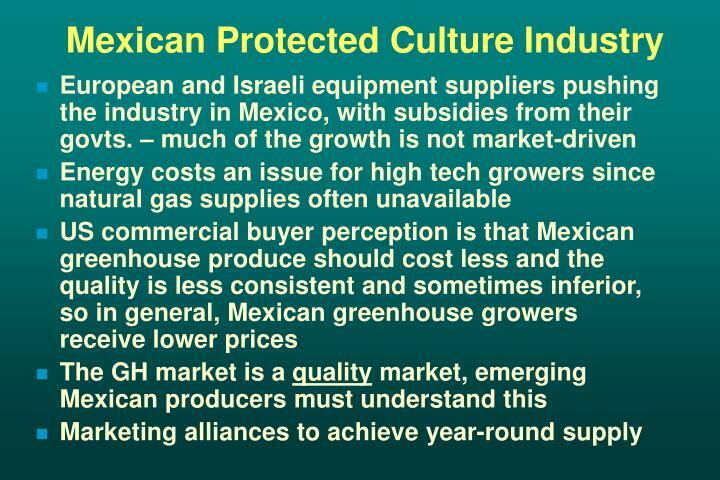 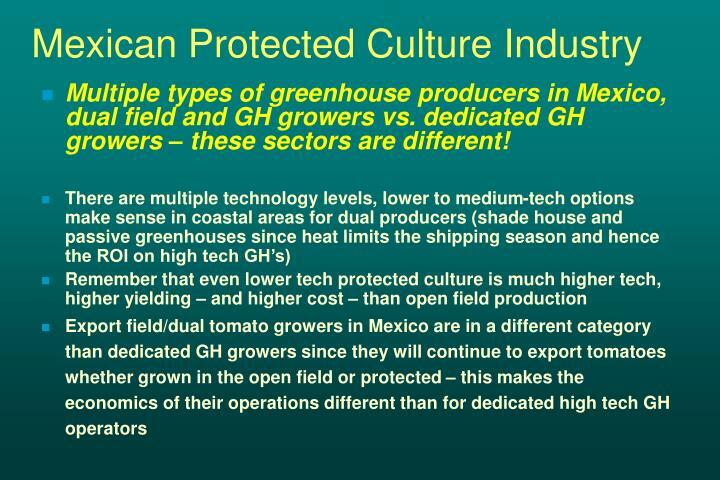 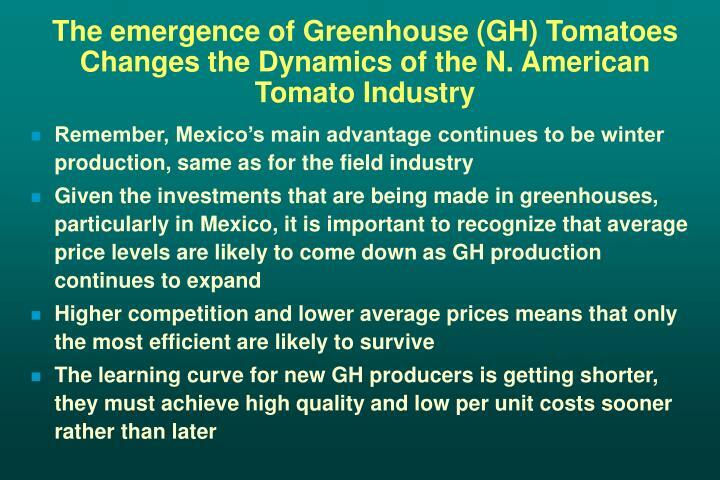 Multiple types of greenhouse producers in Mexico, dual field and GH growers vs. dedicated GH growers – these sectors are different! 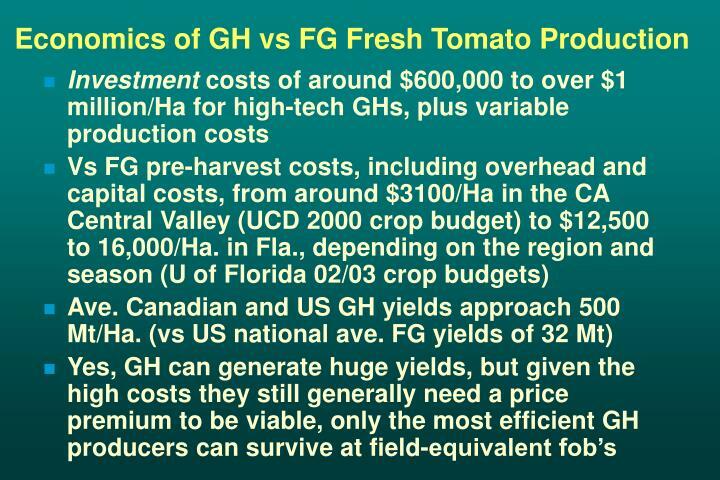 Clearly, with this kind of variation in yields and costs it will take some time to see how the industries shake out in all three countries. 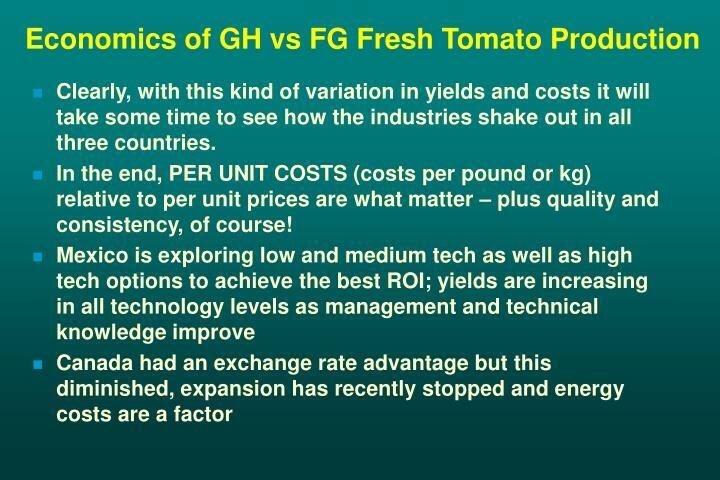 In the end, PER UNIT COSTS (costs per pound or kg) relative to per unit prices are what matter – plus quality and consistency, of course! 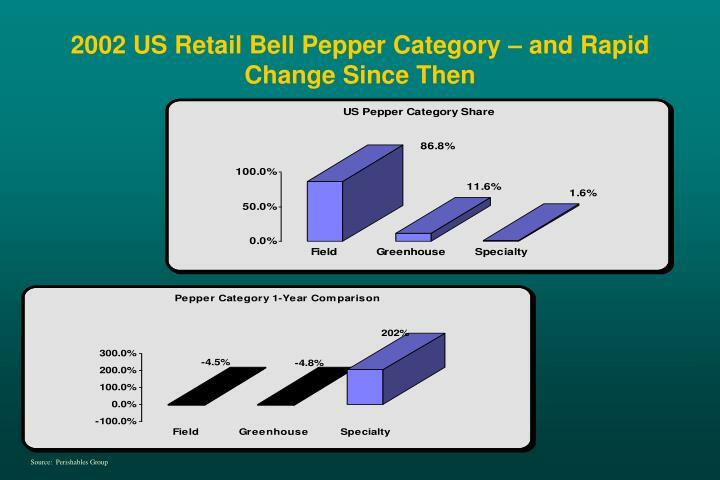 Alliances that exploit relative strengths, marketing and promotion are critical!